Famous Bombers of World War II, Vol. 1 and Vol. 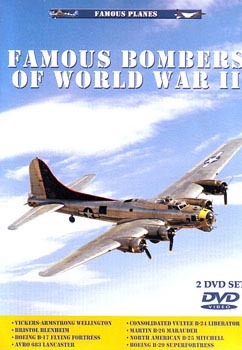 2 Twin-Pak DVDs, Famous Planes Series - This two-DVD set examines eight Allied bombers, their history, development, and the operational role they played during World War II. Famous Planes Series puts you in the cockpit of the greatest military aircraft ever flown. This all action film features dramatic combat sequences, thrilling close up footage, and inter-views with the men who flew these famous planes.